​Tasting Includes Heirloom Apples, Goat Cheese, Caramel Sauce, and Bread. Join Doug Hundley as he shares his knowledge and harvest of heirloom apple varieties for tasting. An incredible diversity of apples is part of the heritage of the Appalachian region. Now, many of us are familiar with less than 10 varieties offered in grocery stores. Douglas W. Hundley is a 25 year veteran of the NC Cooperative Extension Service at the Avery County Center. Doug helped build the Integrated Pest Management (IPM) Program in Avery County and across the regional Christmas Tree industry. He began studying the heirloom apples of Western NC about 2002, locating, identifying, and propagating over 50 heirloom apples varieties. These apples are thought to be the mainstay of the home apple orchards of the region in the 1800 and 1900s. 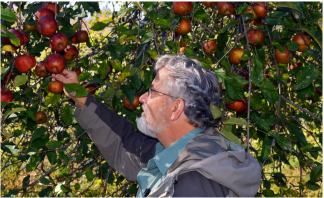 Doug helped to establish two community preservation orchards in Avery County and has helped many people to learn about, obtain, and successfully grow heirloom apples over the past 15 years. ​Now retired, Doug continues to identify old heirloom apples and advise others with the establishment of cider and home apple orchards. 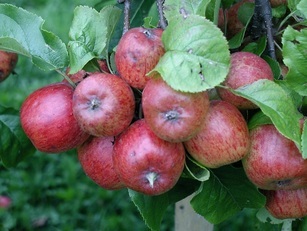 He continues to write extensively including a newsletter on heritage apples as “Doc Scrumpy”. Doug now does custom grafting and grows the more common heirloom apple varieties, distributing them through the Extension Plant Sales in Western NC. Charge is $10 for students, $15 per person, and $25 for two. Tasting includes: apples, and goat cheese. Day-of price: $15 for students, $20 per person, and $30 for two. All proceeds will benefit Blue Ridge Women in Agriculture.